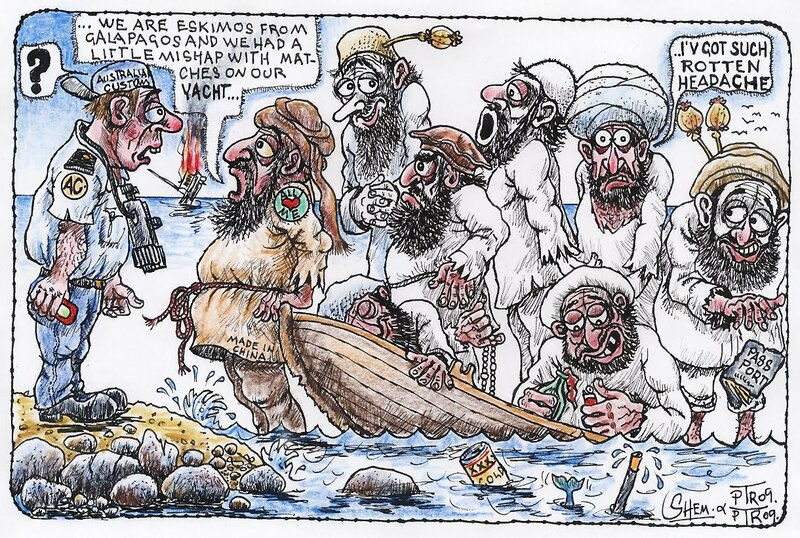 Werner's Cairns blog: Muslims, Boat People, Copenhagen and Afghanistan: a costly mix! Muslims, Boat People, Copenhagen and Afghanistan: a costly mix! Where are we heading in Australia? Who should come to our country? I’m not against Australia reaching a population of 35 million, but I hope that they will be offspring of people who want to preserve the Australian way of life, and not of the people whose “bible” says to destroy the infidels, in other words anybody other than Muslims. When will the Australian government wake up to the fact that the Muslims in this country are producing far more children than anybody else? Would that ring a bell with them? Of course not, they are all bleeding hearts and they can only think as far as to the next election and the votes they get from those people. Unfortunately Australians are producing far too few children to preserve our culture, and Australia will be a Muslim country and under Sharia Law in the not too distant future. I am worried about the kind of Australia in which our grandchildren and great grandchildren will be living. We can already see which way we are heading; our own Cadbury Company is kowtowing to the Muslims here in Australia, by putting the Halal certification symbol on their chocolate. The question begs, why they didn’t also put a Christian or Jewish symbol on the packet – no more Cadbury chocolate for us. I’m not xenophobic, but I believe that only people with the same mindset as we Australians who will assimilate and integrate should be allowed into this country, and not people who cover up their faces and walk around in pyjama-like drapes, and people you never see talking to Australian neighbours or see at our sporting venues. “We decide who comes to this country and under what circumstances” should still be in place, and not the soft options that Rudd has replaced this with. We will now have more trouble watching our northern Coastline, which will cost us millions, and of course the sm ugglers know now that when they are close to Australia they do something to the boat, and if any of our ships is close by we are obliged to rescue them, then it immediately becomes our problem. Click on picture to enlarge. I agree with Barnaby Joyce, either send them back to the country they came from or to a country of their religion, which would be a potent message. The latest pursuit of Rudd and his cohorts is to sign the ETS treaty in Copenhagen, which will cost Australians billions, will do nothing for global warming, and will give significant control over how we run our economy to an unelected overseas mob we probably do not want to have anything to do with. This money could be much better spent in Australia than in countries that the corrupt United Nation’s majority of third country members would dictate that it will have to be spent. Let’s hope that enough countries with common sense see the folly of this treaty and will not sign, and hopefully for our interest it will not see the light of day. If you value your life and your freedom, listen and pass it on to all your contacts and especially your local politicians. . Alan Jones talks to Lord Monckton, British climate change sceptic, who says the Copenhagen treaty is about creating a world government. I doubt if Rudd really knows what is going on in this country; he is more out of it than in it, just grandstanding in other countries and inflating his already over inflated ego. I often wonder why we have a Minister of Foreign affairs who should be talking to other heads of government when Rudd is doing it all, and only giving the Foreign Minister tasks that Rudd doesn't want because they bring less media attention or exposure. And since I’m in full flight expressing an opinion, I have to say something about the futile, un-winnable, and costly in lives and money, war in Afghanistan. Recently another frightening form of casualties of that war came to light, which is almost as bad as the death of our young soldiers. It is the drug addiction of the soldiers that are returning, with their lives probably ruined or needing long term rehabilitation, which may or may not bring them back on track. I don’t know why we are there. If our government, or any other government involved in this conflict believes that we can defeat terrorism there, or bring change to this country, then they are engaged in wishful thinking or it is just unmitigated pie in the sky. The Russians left Afghanistan like a dog with its tail between its legs after fighting for nine years. The countries that are now involved in Afghanistan will sooner or later experience the same fate. The troops presently in Afghanistan have far superior firepower than the Terrorists or the Taliban, but after eight years there are few noticeable benefits, if any, to the Afghan population. What is noticeable is the heartbreak, the destruction and the corrupt government. This is not a worthy cause for us. Anybody who has watched the ABC’s Four Corners program “Afghanistan, on the Dollar Trail” on the 19.10.09 would have been utterly disgusted to see the corruption on a grand scale. I cannot understand why we and other countries keep pouring money into this country where it will disappear without a trace. The Millions of dollars Australia is spending in Afghanistan has to be borrowed money, because the nest egg put aside by the Howard government for a rainy day has gone. This money will have to be paid back and will be a millstone around the neck of generations of Australians. Good on you, Werner, you put it into a nutshell what most Australian think, but not dare to say it. I admire your courage to bring it into the open. Keep up the good work. We enjoy reading your blog.